The Green River Formation of the west-central United States: Flood or post-Flood? Many creationists believe the Genesis Flood was responsible for the bulk of sedimentary rocks and fossils. However, disagreements often arise in trying to determine where the Flood/post-Flood boundary should be placed in the stratigraphic record. This forum is a friendly exchange between two young-earth creationists who hold differing views on the origin of the Green River Formation (GRF). The authors have examined the rocks in the field together. Mike Oard will defend the thesis that the GRF was deposited in the Flood and John Whitmore will defend the thesis that it is a post-Flood lacustrine (lake) deposit. This paper outlines the geological setting of the GRF. The largest of the Green River basins is the Greater Green River Basin (once thought to have been occupied by ‘Lake Gosiute’), which covers 51,000 km2 and averages over 600 m in thickness.3 It is subdivided into four major sub-basins (Green River, Washakie, Sand Wash and Great Divide). The north-south trending Rock Springs Uplift roughly divides the Greater Green River Basin in half, separating Green River Basin from the other three sub-basins. The Greater Green River Basin is bounded on all sides by various uplifts, including the Wind River Mountains to the north and the Uinta Mountains to the south. Stratigraphically, the basin has been subdivided into numerous members and ‘tongues’. Many of the units are not continuous across the breadth of the basin, but are local units, often confined to sub-basins. There are three main formations in the basin. 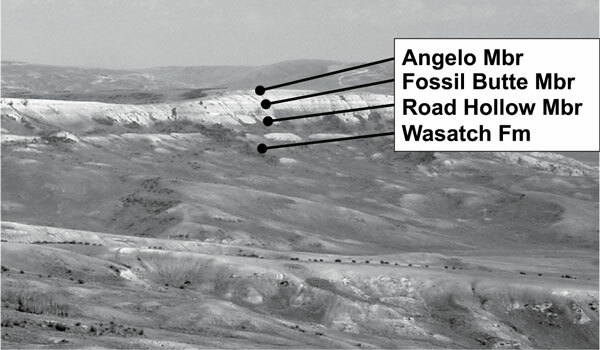 The lowest is the Wasatch Formation, which is coarser grained and considered fluvial. In the Greater Green River Basin, the Wasatch underlies the GRF, but it also occurs around the edges of the basin, where it laterally intertongues with the GRF. 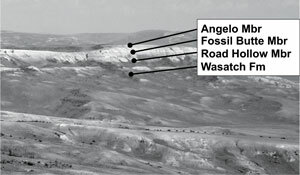 Overlying the GRF are the Bridger and Washakie Formations. They consist mostly of volcanoclastic sediments and are thought to have been deposited in fluvial and lacustrine settings. 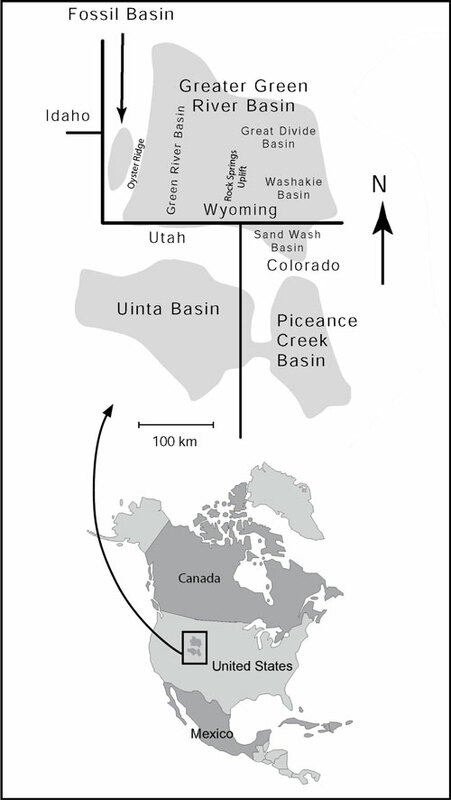 The Uinta and Piceance Creek Basins occur south of the Uinta Mountains in Utah and Colorado. They have many similarities to Fossil Basin and the Greater Green River Basin. However, this forum will primarily address Fossil Basin and the Greater Green River Basin. 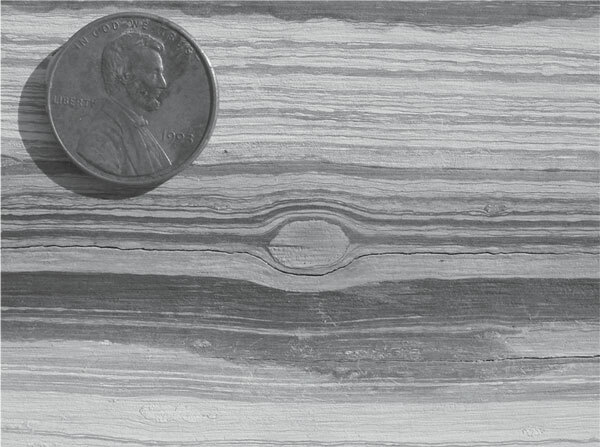 Evidence from the GRF has been used to strongly challenge creationists on biblical Earth history.8,9 It has been argued, based on the number of so-called varves (figure 6) in the GRF, that it took between 5 and 8 million years to be deposited.10 A varve, by definition, is ‘a sedimentary laminae or sequence of laminae deposited in a body of still water within one year’s time’.11 Note that by definition a ‘varve’ is a sedimentary layer that is an annual event. The terminology has been used (and misused) to describe the finely laminated sediments of many different types of lakes. Because the finely laminated sediments of the GRF have been interpreted as ‘varves’, it is supposed that they formed over millions of years of geological time, blowing the Creation-Flood model timescale out of contention. Whitcomb and Morris argued, in The Genesis Flood,8 that the GRF and its related formations were deposited in the late Flood. 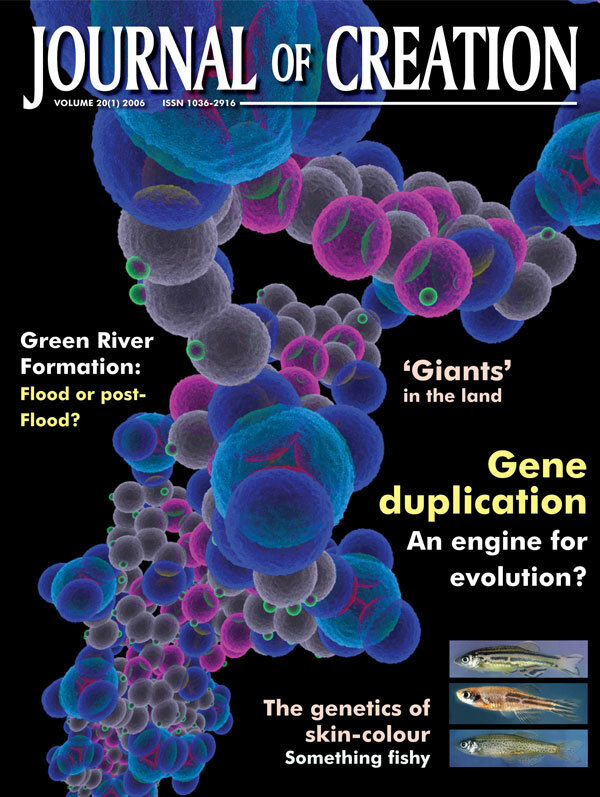 Since that time a number of creationists have come to believe that the GRF was deposited in a large post-Flood lake.12–14 They see evidence of a lacustrine ecology with rapid deposition of lake laminae that are not true varves.15 These creationists believe that the Flood/post-Flood boundary occurs in the vicinity of the Cretaceous/Tertiary boundary at many locations. Whitmore studied the GRF in Fossil Basin as part of his Ph.D. work at Loma Linda University.16–18 He has also examined parts of all the other Green River basins and believes they are best interpreted as post-Flood lakes based on their paleontology, lithologic facies patterns, mineralogy and other features. On the other hand, some other creationists have come to believe that the Flood/post-Flood boundary is generally in the late Cenozoic.19–23 Oard has been doing extensive work in the geological subfield of geomorphology and sees strong evidence everywhere that the Flood/post-Flood boundary is in the late Cenozoic.24–26 Since the GRF is dated as Eocene (early Tertiary within the uniformitarian geological column), he believes it very likely formed during the Flood. Oard has briefly examined the geomorphology of the Greater Green River, Uinta and Piceance Creek Basins a few times, which have reinforced his Flood leanings for the formation. Together, in the summer of 2004, we examined the GRF. We primarily focused on Fossil and small parts of the Greater Green River Basin. We challenged each other with data from the field. Although neither one of us has changed his mind, we now have a better understanding of the other’s interpretation. This friendly forum is a result of this exchange in the field. The purpose is to present observational data, along with interpretations, for both sides of the issue and to let the reader decide. At the same time, we will be presenting evidence why the uniformitarian interpretations are not correct. We believe that this exchange of information and deductions is a very informative way to communicate with the readers about the complex geology of the GRF, and to illustrate how that geology is interpreted within a biblical framework. It is our hope that the discussion that follows will more clearly elucidate the Flood/post-Flood boundary in other areas of the world. Dickinson, W.R., Klute, M.A., Hayes, M.J., Janecke, S.U., McKittrick, M.A. and Olivares, M.D., Paleogeographic and paleotectonic setting of Laramide sedimentary basins in the Central Rocky Mountain region, Geological Society of America Bulletin 100 (7):1023–1039, 1988.Return to text. Resultant search for ‘Green River Formation’ in GeoRef , <www.georef.org>.Return to text. Roehler, H.W., Introduction to Greater Green River Basin geology, physiography, and history of investigations, U.S. Geological Survey Professional Paper 1506-A :A1–A14, 1992.Return to text. Buchheim, H.P. 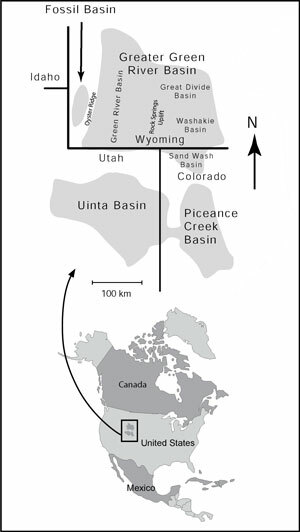 and Eugster, H.P., Eocene Fossil Lake: The Green River Formation of Fossil Basin, southwestern Wyoming; in: Pitman, J.K. and Carroll, A.R. (Eds. ), Modern and Ancient Lake Systems—New Problems and Perspectives , Utah Geological Association, Salt Lake City, pp. 191–208, 1998. Return to text. Personal communication with H. Paul Buchheim, 2004.Return to text. Grande, L., Paleontology of the Green River Formation, with a Review of the Fish Fauna, 2nd edition, Bulletin 63 of the Geological Survey of Wyoming, Laramie, 1984. Return to text. 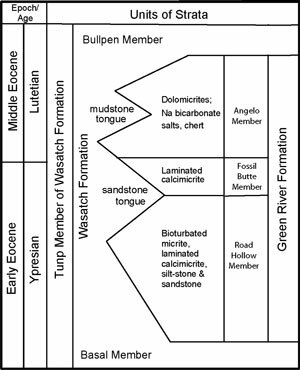 Buchheim, H.P., Stratigraphic revision of the Green River Formation in Fossil Basin, Wyoming: Three distinct phases of Fossil Lake, Geological Society of America Abstracts with Programs 34 (6):479, 2002. Return to text. Whitcomb, J.C. and Morris, H.M., The Genesis Flood: The Biblical Record and its Scientific Implications, Presbyterian and Reformed Publishing, Phillipsburg, NJ, 1961.Return to text. Van Till, H.J., Snow, R.E., Stek, J.H. and Young, D.A., Portraits of Creation, William B. Eerdmans Publishing, Grand Rapids, MI, 1990. Return to text. Bradley, W.H., Varves and duration of Eocene Epoch, Geological Society of America Bulletin 40 (1):133, 1929.Return to text. Bates, R.L. and Jackson, J.A. (Eds. ), Dictionary of Geological Terms, 3rd ed., Anchor Press/Doubleday, Garden City, NY, 1984. Return to text. Brand, L., Faith, Reason, and Earth History, Andrews University Press, Berrien Springs, MI, 1997.Return to text. Wise, K.P., Faith, Form and Time, Broadman & Holman, Nashville, 2002.Return to text. Austin, S.A., Communication from Creation 2003 presentation, Harrison, IN, 2003. Return to text. It is believed the laminations within Fossil Basin cannot be annual varves because the number of laminae that occur between two volcanic ash beds increase in number (up to 35%) from the basin centre to the basin margin. For example, see Buchheim, H.P. and Biaggi, R.E., Laminae counts within a synchronous oil shale unit: A challenge to the ‘varve’ concept, Geological Society of America Abstracts with Programs 20 (7):A317, 1988. Laminae have been counted at many sites between the basin margin and centre (>34 locations in an unpublished report to National Park Service by Buchheim, 1993). Buchheim continues to maintain the laminations cannot be varves and outlines a possible mechanism for variation of laminae number, thickness, composition and formation in: Buchheim, H.P., Paleoenvironments, lithofacies and varves of the Fossil Butte Member of the Eocene Green River Formation, southwestern Wyoming, Contributions to Geology, University of Wyoming 30 (1):3–14, 1994.Return to text. Whitmore, J.H., Experimental fish taphonomy with a comparison to fossil fishes, Ph.D. dissertation, Loma Linda University, Loma Linda, CA, 2003. Return to text. Whitmore, J.H. and Brand, L., A novel method to determine relative lake depth using vertical and lateral trends in fish taphonomy (Green River Formation, Fossil Butte Member, Wyoming), Geological Society of America Abstracts with Programs 35 (6):105, 2003.Return to text. 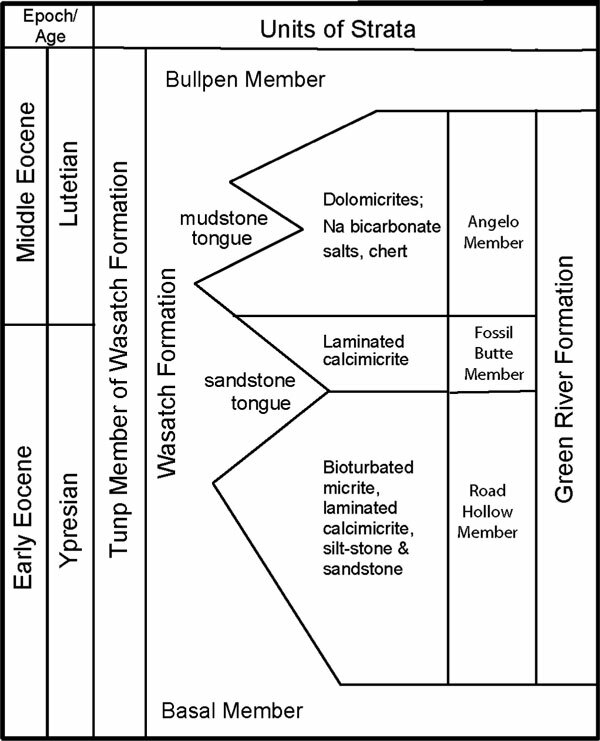 Whitmore, J.H., Brand, L. and Buchheim, H.P., Implications of modern fish taphonomy for the preservation states and depositional environments of fossil fish, Fossil Butte Member, Green River Formation, southwestern Wyoming, Geological Society of America Abstracts with Programs 34 (6):556, 2002. Return to text. Coffin, H.G., Origin by Design, Review and Herald Publishing Assn., Hagerstown, MD, 1983.Return to text. Holt, R.D., Evidence for a Late Cainozoic Flood/post-Flood boundary, Journal of Creation 10 :128–167, 1996.Return to text. Oard, M.J., Where is the Flood/post-Flood boundary in the rock record? Journal of Creation 10 :258–278, 1996. Return to text. Morris, H.M., The geological column and the Flood of Genesis, CRSQ 33 :49–57, 1996.Return to text. Roth, A.A., Origins Linking Science and Scripture, Review and Herald, Hagerstown, MD, 1998.Return to text. Oard, M.J., Vertical tectonics and the drainage of Floodwater: a model for the Middle and Late Diluvian period—Part I, CRSQ 38 (1):3–17, 2001. Return to text. Oard, M.J., Vertical tectonics and the drainage of Floodwater: a model for the Middle and Late Diluvian period—Part II, CRSQ 38 (2):79–95, 2001. Return to text. Oard, M.J. and Klevberg, P., Deposits remaining from the Genesis Flood: Rim Gravels of Arizona, CRSQ 42 (1):1–17, 2005. Return to text.